Welcome friends! Thanks for joining me for A Fortnight of Fright over here on Books Take You Places! 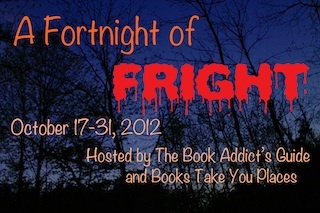 Fortnight of Fright is an event hosted over two weeks, by myself and Brittany from The Book Addicts Guide, we will be featuring some fabulous posts on all things Halloween! Today I am going to share some “true” facts about Halloween! After taking a peek around here, make sure you head over to Brittany’s blog to enjoy some more Halloween fun!! Halloween has always fascinated me, it is my mother’s favorite holiday and therefore we always went all out on decorating and celebrating the holiday. Additionally, many of my family members on my father’s side loathe the holiday. They believe it to be a “day of evil” and being the precocious gal that I am I spent ample time educating myself on the origin of the holiday so that I could argue with them at every chance! I’m not going to bore you with lectures or paragraphs but I thought it would be fun to share some quick info on what Halloween really represents, past the candy and costumes. Halloween is believed to have originated from the Celtic festival of Samhain, the last day of harvest before the “dark days,” more commonly known as “winter.” It was believed that on Samhain (and Beltane) the door to the Otherworld was open and therefore spirits were able to roam the Earth. It was believed that some were fearful of the spirits so they carved faces into things such as turnips and placed them in their windows to ward off evil spirits. This is of course, why we carve Jack o’ lanterns today. This is also why some wore costumes, the people believed that this would trick the walking spirits so that they would not possess the living. There is much contemplation on the origin of trick or treating. It is believed that it comes from the celebration of All Souls Day in England. On this day, the poor would go door to door asking for food and once received would pray for the souls of the givers dead relatives. This was called going “a-souling” and replaced the practice of leaving wine and cakes out for the spirits of their dead. Additionally, the term “Trick or Treat” can be translated to “give me a treat or I will cause some mischief,” there was a time that those requesting treats would perform some “trick” also known as a song and dance as “payment” for their treat. Other traditions, such as certain foods that were eaten, bonfires and bobbing for apples goes along with the Samhain tradition of (the end of) harvest. These things are all symbolic to the culture and it was believed that peeling apples assisted in telling the future or answering questions asked while peeling. That’s it for me for today, do you have any traditions for Halloween? Anything I may have missed? Thanks for reading, friends. I really hoped you all enjoyed A Fortnight of Fright over here on Books Take You Places! While you’re all here, have you heard of All Hallow’s Read? Basically, Neil Gaiman is behind it and the gist is that during the week of Halloween, or on the night itself, you give someone a scary book. 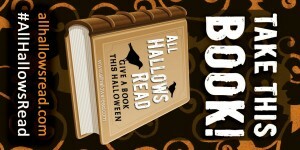 Skip the candy and GIVE OUT BOOKS, PEOPLE!! Want more info (you shouldn’t because, did you see about NEIL GAIMAN?!) go to the website and READ ALL ABOUT IT! This entry was posted in Event and tagged All Hallow's Eve, All Hallow's Read, Fortnight of Fright, Halloween, Holidays, Samhain. Bookmark the permalink.